What does SoftBank’s $32.2-billion acquisition of mobile chip designer ARM mean in the long run? Monday’s announcement that SoftBank Group Corp. would be purchasing U.K.-based chip designer ARM Holdings PLC for 24.3 billion pounds ($32.2 billion) represents a sound, but head-scratching, investment by the Japanese telecommunications giant, experts say. R. “Ray” Wang, founder and principal analyst of Silicon Valley-based Constellation Research Inc., wasn’t surprised by the acquisition, regarding it as a simple matter of SoftBank recognizing a superior product when it saw one. Wang’s colleague, Constellation vice president and principal analyst Holger Mueller, saw it differently, however: Mueller said while he considers ARM a terrific investment for any tech company, given its success at applying low-power designs to a variety of mobile and Internet of Things (IoT)-enabled devices, he was at a loss to explain why SoftBank would attempt the acquisition in the first place. “I fail to see an overall synergy strategy across the holdings,” Mueller said. “But that may not be SoftBank’s immediate strategy. In addition to ARM, SoftBank’s other high-profile investments in recent years have included a 35 per cent stake in Yahoo Japan, a controlling stake in American telecom provider Sprint, which was acquired in 2013, and an early stake in Chinese tech giant Alibaba, part of which it sold earlier this year for $7.9 billion USD. ARM, meanwhile, has become the largest London-listed tech company by market value since its founding in 1990. While the company does not manufacture any chips of its own, its processor and graphics technology is used in some 85 per cent of mobile devices worldwide, including smartphones manufactured by Samsung, Huawei, and Apple. 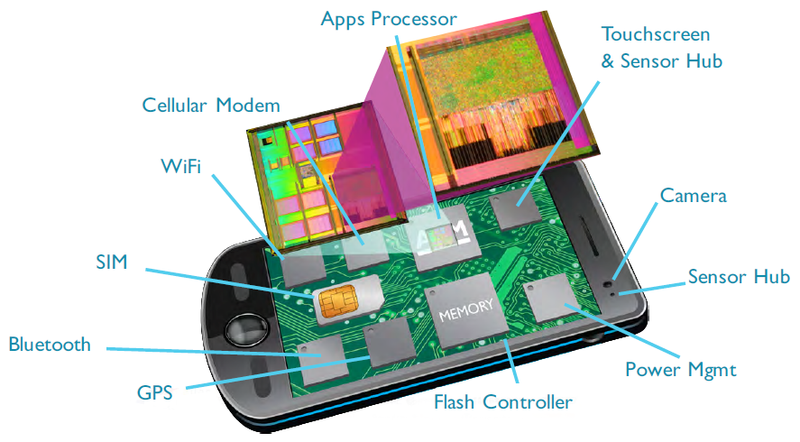 Some of the many, many, many mobile device components that utilize ARM technology. In a July 18 presentation that was broadcast online, Son said there were four key reasons for the acquisition: ARM’s market leadership in the mobile space; its growth potential not only in the mobile arena, but in enterprise infrastructure and IoT; its fit with SoftBank, which aims to invest in what he called “powerful secular trends”; and the benefits for ARM’s own long-term strategic investment. According to Gartner, WSTS, and ARM estimates, the chip designer presently has 32 per cent market share between the mobile computing, consumer electronics, enterprise infrastructure, automotive, and “embedded intelligence” (IoT) industries, and expects to gain an additional nine per cent market share by 2020. ARM’s 2015 market share in various industries versus projected share by 2020. To help it along, SoftBank plans to invest $40 billion USD into ARM’s mobile computing efforts, $36 billion USD into the development of enterprise infrastructure, and $45 billion into embedded intelligence between now and 2020. As part of the acquisition, SoftBank has also pledged to preserve ARM as an independent organization, including its U.K. headquarters, and to double the company’s U.K. workforce over the next five years. In the aforementioned release, ARM chair Stuart Chambers called SoftBank’s offer “compelling” for the company’s shareholders, adding that the Japenese tech giant had convinced ARM’s board that their company would retain its unique corporate culture and business model, and “continue to play a key role in the development of new technology” over the next five years. Wang said that if SoftBank plays its cards right, it will have an opportunity to make back its investment thanks to future demand for sensor arrays and IoT devices, many of which will require ARM chips. “With everything needing a computer, SoftBank is betting on the 80 billion sensors and 50 billion devices that Constellation has forecast for 2020,” Wang said.